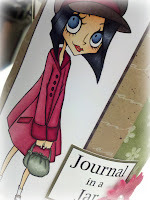 Kards by Katie Kreations: Tickled Pink Stamps New Challenge Blog! As a gift for a friend who loves to journal I decided to make a Journal in a Jar. She loves funky vintage clothes so I couldn't resist using the Lil Fashionette digi stamp 30's Lylah from the Tickled Pink Stamp Store because I could envision her in that fabulous coat clutching a sweet little purse just like Lylah is. 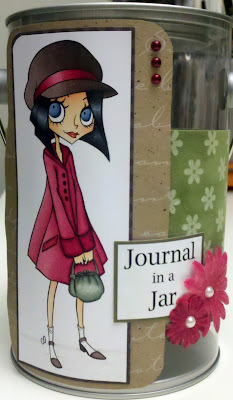 The jar was empty when I took the picture but I filled it with journal prompts that I printed in different fonts from my computer before I gave it to her and added a journal to finish. I had so much fun putting this together, and especially coloring this amazing image. I'm happy to say the gift left her speechless which was a huge compliment. I'm already trying to think how I'm going to top it next time! Oh wow what an amazing idea, how lucky your friend is to have a caring and talented friend like you! Your jar is gorgeous and your colouring is fabulous! Thank you so much for joining us at TPSC this week! What a great project, love it. And your coloring is really wonderful! Thank you so much for joining our first weekly challenge over at Tickled Pink Stamps! Gorgeous jar what a great idea, I'vejust brought this image and really enjoyed coouring it.